Flomaton Antique Auction has suspended it’s monthly auctions indefinitely, but that hasn’t stopped Nevin Heller from bringing quality antiques to the world. I was perusing his antique site, “Circa 19th Century” (a business which appears to have been in operation since 1986) and the chair above’s overall leg shape and their zoomorphism reminded me of another chair that I have profiled before. Nevin’s chair is pure Rococo while the chair in the back of my mind to compare it to is Gothic/Rococo (and my posting inspired many comments of displeasure in it’s execution). The chair was identified by a commenter as likely being by Klauder and Deginter, based on an attribution to the Philadelphia makers of a similar chair by the Philadelphia Antiques Show. 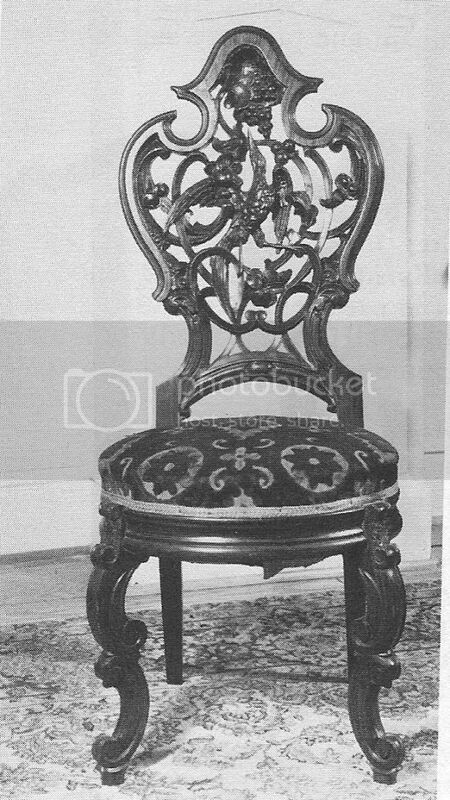 The text accompanying the Antiques Show photo states that “this design must be viewed as a bit heavy and weird [referring to the Gothic/Rococo chair], a quality it shares with Klauder & Deginter’s Rococo furniture at Loudoun”. The reference to the Rococo furniture at Loudoun piqued my interest and I spent some time trying to find images of the furniture to compare to Nevin’s, but to no avail. More digging will be necessary.